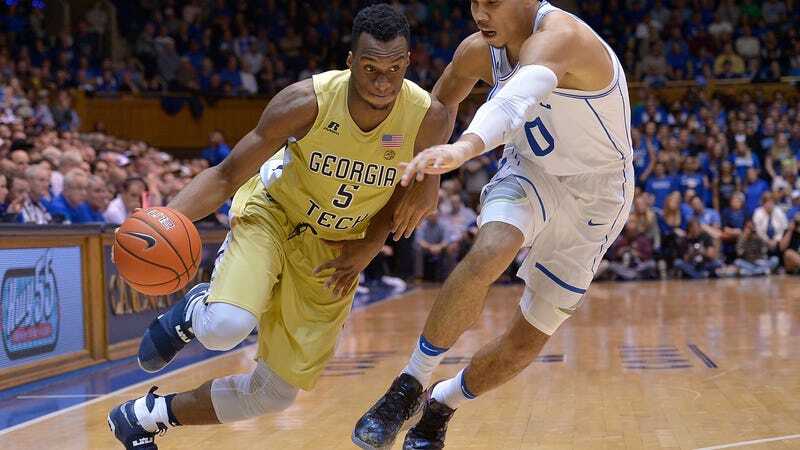 Georgia Tech basketball senior Tadric Jackson and sophomore Josh Okogie have each been suspended three and six games, respectively, by the NCAA after accepting benefits from Ron Bell, a former friend of Yellowjackets head coach Josh Pastner. The school self-reported the violations to the NCAA earlier in November, holding out the players for their season opener against UCLA (which will count as part of the suspension). According to Georgia Tech, the players received plane tickets, shoes, and apparel from Bell. Okogie’s benefits were valued at around $750, and Jackson’s were around $525. Georgia Tech also said that Pastner immediately reported the violations when he became aware of them, while Bell said Pastner only did so after Bell threatened to expose the violations. The NCAA penalties appear to only punish Jackson and Okogie for the self-reported benefits, as the guidelines for a suspension are six games for $525 of benefits, and nine games for $750. Correction (8:54 p.m. ET): One of the suspended players is Tadric Jackson, not Tadric Johnson. The post has been updated to reflect that.